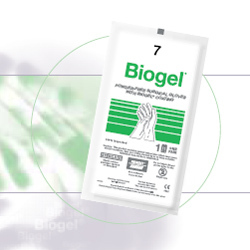 Biogel is the original latex surgical glove of the Biogel product line series. Biogel has become dubbed the best surgical glove by many surgeons due to the fit and easy donning of the gloves. Many surgeons state that Biogel surgical gloves are shaped well to conform to the human hands. A great fit is important in surgical gloves because it minimizes fatigue that occurs during long procedures and is comfortable. The Biogel surgical gloves revolutionize the industry with their inner coating polymer that allows surgeons to easily donn a pair of surgical gloves even while their hands are wet. Traditionally, medical gloves without inner coatings can be quite difficult to wear especially when the hands are wet. Since surgeons must scrub in prior to any procedure, the Biogel surgical gloves saved clinicians valuable time because now surgeons no longer had to wait for their hands to dry. Biogel quickly became the most successful latex surgical glove in the world and to this day, Biogel surgical gloves have the highest market share in North America. Biogel is recommended for use in all general surgery procedures.